Whether you’re selling freshly baked bread, accounting services or IT support, the way you market yourself will have a dramatic impact on the clients you attract and the amount that you can charge for your services. A commonly held belief is that “it’s all about the product” i.e. if you have a better product or service people will automatically be more likely to buy from you and pay you more for it. While this is true to some extent, the law of diminishing returns comes into play when your product or service reaches a “good enough” level. After all how much better can your IT support or accounting services or bread be than that of your competition? Once you’ve reached a level of competence, the real profit comes from the way you market yourself. How Much Money Does A Violinist Make? How much does a world-class violinist make? Well, that depends on how he markets himself. Have you ever heard of Joshua Bell? He’s one of the finest classical musicians in the world. He plays to packed audiences all around the world, making upwards of $1,000 per minute. The violin that he plays is a Stradivarius violin built in 1713, currently valued at $3.5 million. This particular Stradivarius violin, being close to 300 years old, is renowned to be the most beautiful sounding violin ever crafted. So, here we have the finest violinist in the world playing the most beautiful violin ever. It’s safe to say that Bell, as an musician, is the best at what he does. At the height of his career he was approached by the Washington Post to participate in a social experiment. They wanted him to play at a local subway for an hour, during which thousands of people would walk by and hear him playing. So on the morning of January 12, 2007, Bell played through a set list of classical masterpieces with his violin case open. Can you a guess how much the finest violinist in the world, playing a beautiful $3.5 million violin made in hour? The finest violinist, playing the most beautiful instrument made a meager $32 from his “customers”. The same violinist played in a Boston concert hall a few nights earlier. It was a performance where audience members paid $100 or more per ticket. During that event, he earned over $60,000 per hour. The same talented musician, playing the same music on the same violin, yet in one instance he earns $32 an hour and in another, he earns $60,000 per hour. What made the dramatic difference? In a word – positioning. If you’re a professional musician and you position yourself as a subway busker, your “customers” will treat you as such and pay you accordingly. Conversely, if you position yourself as a professional concert performer you attract a totally different customer and once again get paid accordingly. In other words, people will generally take you at your own appraisal – unless proven otherwise. Of course, you can’t cheat by positioning yourself as a professional musician and then show up and be unable to perform at a high level. The same is true regardless of what business you’re in. If you’ve got a quality product or service, what’s stopping you from positioning it at a much higher level – offering it a premium price and attracting a much higher quality of customer? Resolve to stop positioning yourself as a commodity and competing solely on price. The result to your bottom line will be phenomenal. Allan is a serial entrepreneur, rebellious marketer, technology expert and #1 bestselling author. He helps businesses and entrepreneurs around the world grow fast and build value. Your articles were very helpful and informative. We look forward to taking our company in a new direction in 2014 with the assistance of the knowledge you provide to us. your articles are very insightful into human behaviour, U look forward to sharing this with my team mates and seeing the benefits accrue. please share more of your knowledge and experience, we need it. 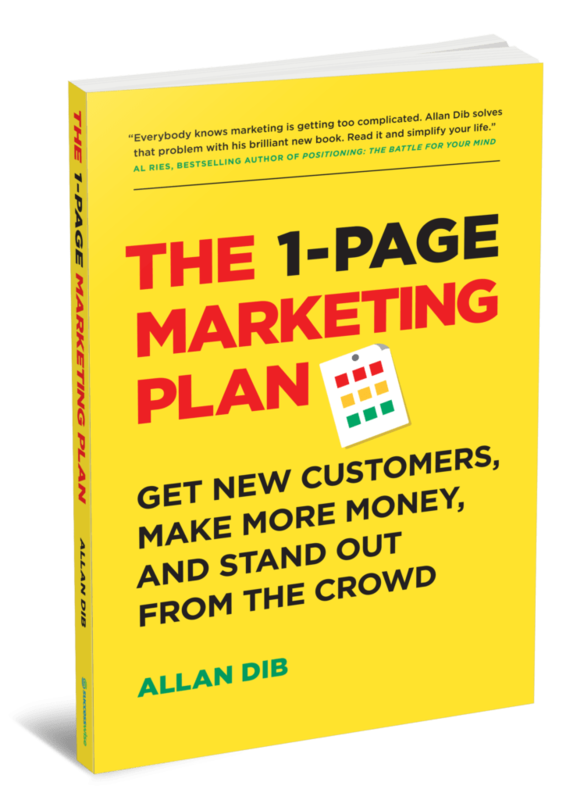 Allan, I have just started reading your book, The 1-Page Marketing Plan and it is so refreshing to hear someone break it down to the basics. Though complicated marketing can get, with your way of putting things in perspective it brings it home. I’m so looking forward to the upcoming weeks and months as I start putting what you say and teach into place.